THE BARCELONA CHAIR - 1929 DESIGN CLASSIC AND DESIGN ICON? DESIGN CLASSIC AND DESIGN ICON? 1. The Barcelona Chair (shown below) is regarded as both a design classic and a design icon. Why is this? You may wish to study the iconic design criteria listed below, before answering this question. HINT: When answering this question, take each of the relevant ‘criteria’ sentences and rewrite them in your own words. Each sentence should include a reference to the Barcelona Chair. Then add any further points that you consider relevant. The Barcelona Chair was displayed at the Barcelona Worlds Fair in 1929, for the German pavilion and from this point in time, it set the standard for other chairs. Its initial design was developed from the folding chairs of the Egyptian Pharaohs and was aimed at an educated and critical audience. It was designed to seat the King and Queen of Spain, if they attended the German Pavilion, during the fair. Its first appearance created critical acclaim amongst designers and manufacturers. Since its first appearance, it has been regarded as a design classic and icon. Its unusual design, curved steel frame and overall aesthetic appearance, set a bench mark for other designers to follow. The chair is still made today and has been copied by other manufacturers. Ground breaking techniques were used during its manufacture. The use of chromed steel flat strips, welded to form a seamless frame was innovative. The application of a chromium finish was bold, as it was a relatively new technique, normally used to coat automotive parts. The leather upholstery with its forty handmade panels, added to the overall quality of the chair. The design improved on past designs, in terms of comfort and choice of materials. Traditional wood based materials were usually the choice of designers, in the 1920s. 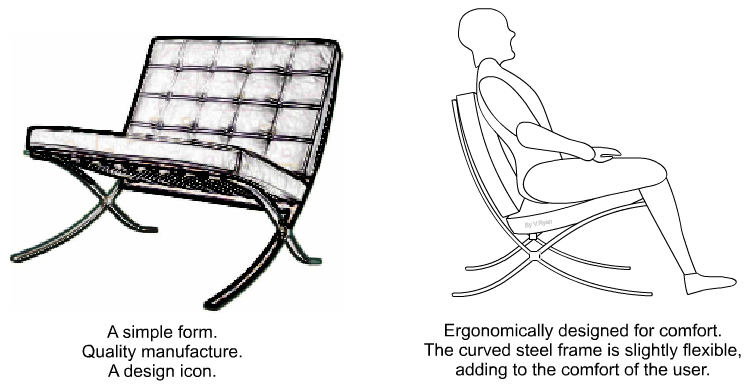 Furthermore, the style applied to the Barcelona Chair broke new ground, compared to the majority of chairs of its era. The chair is aesthetically pleasing due to its simplicity and form and the level of craftsmanship applied to its manufacture. It is a memorable and distinctive design, instantly recognisable and has stood the test of time.